Now the birth of Jesus Christ was on this wise: When as his mother Mary was espoused to Joseph, before they came together, she was found with child of the Holy Ghost. Then Joseph her husband, being a just man, and not willing to make her a publick example, was minded to put her away privily. But while he thought on these things, behold, the angel of the Lord appeared unto him in a dream, saying, Joseph, thou son of David, fear not to take unto thee Mary thy wife: for that which is conceived in her is of the Holy Ghost. And she shall bring forth a son, and thou shalt call his name JESUS: for he shall save his people from their sins. Now all this was done, that it might be fulfilled which was spoken of the Lord by the prophet, saying, “Behold, a virgin shall be with child, and shall bring forth a son, and they shall call his name Emmanuel, which being interpreted is, God with us.” Then Joseph being raised from sleep did as the angel of the Lord had bidden him, and took unto him his wife: And knew her not till she had brought forth her firstborn son: and he called his name JESUS. Now when Jesus was born in Bethlehem of Judaea in the days of Herod the king, behold, there came wise men from the east to Jerusalem, Saying, Where is he that is born King of the Jews? for we have seen his star in the east, and are come to worship him. When Herod the king had heard these things, he was troubled, and all Jerusalem with him. And when he had gathered all the chief priests and scribes of the people together, he demanded of them where Christ should be born. And they said unto him, In Bethlehem of Judaea: for thus it is written by the prophet, And thou Bethlehem, in the land of Juda, art not the least among the princes of Juda: for out of thee shall come a Governor, that shall rule my people Israel. 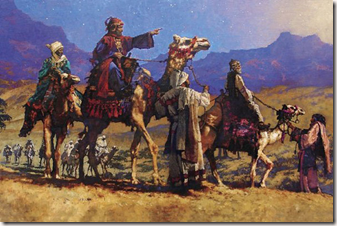 Then Herod, when he had privily called the wise men, inquired of them diligently what time the star appeared. And he sent them to Bethlehem, and said, Go and search diligently for the young child; and when ye have found him, bring me word again, that I may come and worship him also. When they had heard the king, they departed; and, lo, the star, which they saw in the east, went before them, till it came and stood over where the young child was. 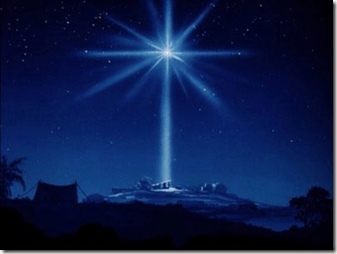 When they saw the star, they rejoiced with exceeding great joy. And when they were come into the house, they saw the young child with Mary his mother, and fell down, and worshipped him: and when they had opened their treasures, they presented unto him gifts; gold, and frankincense, and myrrh. And being warned of God in a dream that they should not return to Herod, they departed into their own country another way. And it came to pass in those days, that there went out a decree from Caesar Augustus, that all the world should be taxed. (And this taxing was first made when Cyrenius was governor of Syria.) And all went to be taxed, every one into his own city. And Joseph also went up from Galilee, out of the city of Nazareth, into Judaea, unto the city of David, which is called Bethlehem; (because he was of the house and lineage of David:) To be taxed with Mary his espoused wife, being great with child. And so it was, that, while they were there, the days were accomplished that she should be delivered. And she brought forth her firstborn son, and wrapped him in swaddling clothes, and laid him in a manger; because there was no room for them in the inn. And there were in the same country shepherds abiding in the field, keeping watch over their flock by night. And, lo, the angel of the Lord came upon them, and the glory of the Lord shone round about them: and they were sore afraid. And the angel said unto them, Fear not: for, behold, I bring you good tidings of great joy, which shall be to all people. 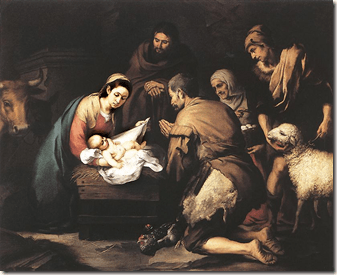 For unto you is born this day in the city of David a Saviour, which is Christ the Lord. And this shall be a sign unto you; Ye shall find the babe wrapped in swaddling clothes, lying in a manger. And suddenly there was with the angel a multitude of the heavenly host praising God, and saying, “Glory to God in the highest, and on earth peace, good will toward men.” And it came to pass, as the angels were gone away from them into heaven, the shepherds said one to another, Let us now go even unto Bethlehem, and see this thing which is come to pass, which the Lord hath made known unto us. And they came with haste, and found Mary, and Joseph, and the babe lying in a manger. And when they had seen it, they made known abroad the saying which was told them concerning this child. 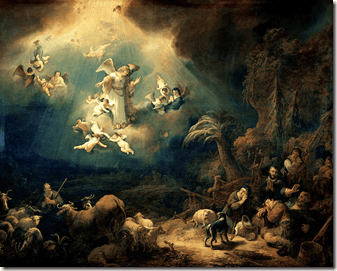 And all they that heard it wondered at those things which were told them by the shepherds. But Mary kept all these things, and pondered them in her heart. And the shepherds returned, glorifying and praising God for all the things that they had heard and seen, as it was told unto them. I was never a huge Peanuts (Charlie Brown) fan, but since I was a child, when I hear Luke Chapter 2 read, I always hear it in Linus’s voice. 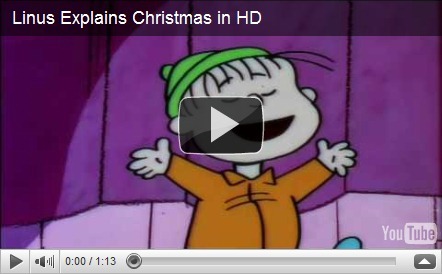 So here is Linus explaining the meaning of Christmas. This entry was posted on Saturday, December 25th, 2010 at 1:05 pm	and posted in Inspiration, Video. You can follow any responses to this entry through the RSS 2.0 feed. Thank goodness, I am not the only one, Jay, LOL.